James Thurber was born in Columbus, Ohio in 1894. Thurber's father was a civil clerk, and his mother, Mame, was an eccentric woman who would influence many of her son's stories. Thurber had two brothers, William and Robert. One day while playing "William Tell" with them as youngsters, Thurber lost the sight in one eye when an arrow pierced it. Ultimately, he would go blind in both eyes, but that never stopped him from writing or drawing. From 1913-1917, Thurber attended the Ohio State University. After college Thurber went to Paris, France to work for the American Embassy. He returned to Columbus in 1920 and started working at the Columbus Dispatch as a reporter. Thurber spent his evenings working on skits for the Strollers and Scarlet Mask theatre groups at Ohio State–where he met his first wife, Althea Adams. The Thurbers moved to New York in 1926 and James began his career as a freelance writer while working for the New York Evening Post. E.B. White (Stuart Little, Charlotte’s Web) introduced James to Harold Ross, editor at the New Yorker, who hired Thurber. Thurber left the staff position at the New Yorker in 1935, but continued to submit cartoons and stories. Thurber wrote nearly 40 books, and won a Tony Award for the Broadway play, A Thurber Carnival, in which he often starred as himself. One of his books, My World and Welcome To It, was turned into an NBC television series in 1969-1970. 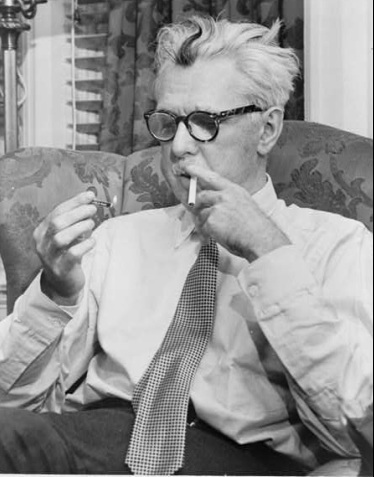 Thurber died of complications from pneumonia on November 2, 1961. Learn more about the life and times of James Thurber from a "stone teller" at Thurber's grave site in Green Lawn Cemetery.